In 2012, China had a total of nearly 300 professional structural adhesive manufacturers with the output rising by 19.6% year-on-year to 453,000 tons, according to the new research report “China Structural Adhesive Industry Analysis and 2015 Forecasts”. 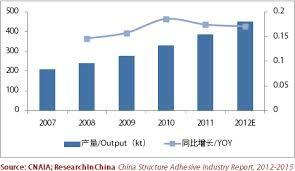 In particular, silicone adhesive, epoxy adhesive and PU adhesive accounted for the highest output, with the combined proportion as high as 90% or more.The report at RnRMarketResearch.com also says that in 2007-2011, China’s output of structural adhesive presented a CAGR of 16.6%, higher than the growth rate of 13.6% of the adhesive industry in the same period. Besides, driven by the robust demand from downstream building, wind power and automotive manufacturing sectors as well as the advances in industrial technology, China-made structural adhesives are expected to see an AAGR of 15%-20% when it comes to output. At the early stage, the development of Chinese structural adhesive industry was heavily reliant on the introduction of overseas technologies and was long monopolized by foreign brands. However, domestic players are now seizing considerable share in some market segments.International tycoons are very confident the in Chinese market and business strategies, and they continue to invest big in China, the report adds.